Federal Premium .308 Win ammo is an excellent choice for sighting in your new rifle, or bagging your next trophy buck! The 150 grain full metal jacket boat-tail bullet has a muzzle velocity of 2,820 feet per second. Federal ammo made in Anoka, MN has a tremendous reputation for reliabilty and quality. Sight in your .308 rifle with the good stuff! The Sporting Arms and Ammunition Manufacturers Intitute (SAAMI) considers .308 Win and 7.62x51mm ammo interchangeable, but check the specifications for your firearm for using this ammo when your rifle does not specifically call for .308 Win. 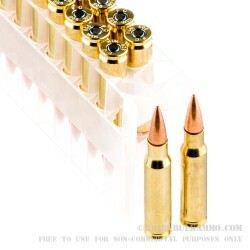 The .308 Win replaced the .30-06 Springfield as the military cartridge of choice in the second half of the 20th century. The .30-06 has a higher twist rate of 1:10 and has longer range capabilities, but the .308 twist rate of 1:12 increases the effect of tumbling upon impact. The significance here is in stopping power. A tumbling bullet will wreak more havoc on the target than a faster, more stable round. This ammo is great. I just ordered the Winchester 147 grain and I wish I got more of this ammo instead. Brand new and great round after round. 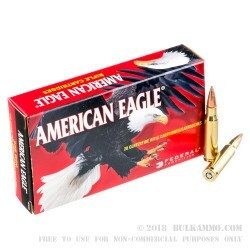 I've been shooting American Eagle .308 ammo for a long time now, and would definitely rate it among the top bargain rounds that I use in my rifle. Federal has always made quality ammunition, and I have yet to have a single issue with them. Best ammo for the money. Dependible and accurate. You guys are great. I ordered my ammo on 6/2/12 and received it 6/6/12. Emails on every step from order to receipt. I will order again. Q: Is the core lead? Meaning is the bullet non-magnetic? 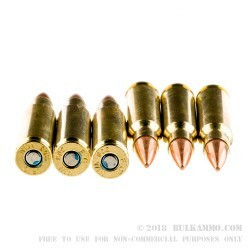 A: Hello Jason, This ammunition features a brass cased, copper coated bullet with a lead core. The ammunition will not attract a magnet. Q: "Boat tail" I have not heard that in reference to a bullet. What is it and how does it affect performance? Thanks! A: A "boat tail" is a slight reduction in diameter at the rear of the projectile. This reduces drag, allowing the bullet to fly farther, faster, and flatter. A: The muzzle velocity of this Federal FMJBT .308 ammo is 2820fps. Q: 2 things I like to know about ammo - 1. Is it reloadable (boxer primed)? (this is already answered in the description - thanks!) 2. Is the primer corrosive? A: No, these Federal .308 Win cartridges are not loaded with corrosive primers. As you noted, the cases are brass and boxer primed, making them excellent candidates for reloading.